In most European countries the biogas sector started by digesting manure in combination with co-products like maize, wheat, grass etc. which can also be used as feed for animals. During the first BioEnergy Farm project, in which farmers were informed about co-digesting and assisted in writing business plans, it turned out that the public opinion regarding large scale co-digesting installations became more negative in the last years. The food-feed-fuel discussion is an important issue in countries like the Netherlands, Germany and Belgium. Also the economic feasibility of co-digestion dropped dramatically due to reduced funding and increased biomass costs. So the implementation of co-digestion is decreasing sharply in Germany, Belgium and the Netherlands. The online biogas scan developed in the first BioEnergy Farm project showed that most farmers are only interested in micro-scale digesters, which only digest the manure of their own farm. The same opinions were heard during the workshops and excursions organised for the farmers. In Belgium the implementation of micro-scale digestion is developing so rapidly in the last few years, that these installations are now in the majority. 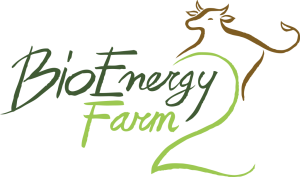 The BioEnergy Farm 2 project emphasises on micro-scale biogas installations which mainly use own manure and feed left-overs from the farm as feedstock. Within the project the farmers will be informed about the existing options for micro-scale digesters. Furthermore they will be assisted in checking the feasibility of a micro-scale digester on their farm. Within these feasibility studies different ways to use the biogas will be analysed; like producing electricity and heat with a CHP installation, gas upgrading for gas grid feed-in, producing heat in a biogas boiler and upgrading the biogas to transport fuel. To improve the profitability of micro-scale installations, the upgrading of the manure to (improved) fertilizers quality will be taken into account as well. This method of manure processing will further increase the sustainability of livestock farming, besides the environmental benefits of the production of biogas and the reduction of greenhouse gas emissions from manure storages. Furthermore within the project the barriers regarding the legal and financial framework will be analysed and guidance will be given to policy makers on how the existing potential for micro-scale, manure based biogas production could be developed.